New to cycling and touring, organizing a suitable bike turned out to be quite a challenge for me. Scared of all things that could go wrong, I set out to find a bike that would meet each and every of our tour operator’s recommendations. Here’s the result, the details of which I’ll explain further below. First, however, let’s have a look at the key criteria that eventually led me to this beauty (or beast?). In summary, TDA Global Cycling preach simplicity: the simpler, the easier to repair in Africa. The more sophisticated, the more likely I’d be screwed if something breaks. Avoiding carbon definitely helped me save a lot of money, but it won’t help me impress with speed. The issue with carbon is that breakage is more likely. Once carbon breaks, it cannot be fixed. In contrast, welding steel or aluminium is supposedly a wide-spread skill in Africa, even in the most remote areas. On the downside, this also means pushing a lot more weight, hence slower speed. When air gets into hydraulic brake cables, or the brake fluid drains, hydraulic brakes need to be bled. Bleeding requires special equipment which we won’t have. So this decision was a bit of a gamble—bet on making it all the way from Cairo to Cape Town without bleeding, or play it safe. Upon strong recommendation from our operator, I didn’t want to take the risk that I would end up sitting on the truck rather than riding my bike. Mechanical brakes it had to be. First, let me clarify a common misperception amongst cycling amateurs (i.e. people like me): While disc brakes are most often hydraulic, and V-brakes are most often mechanical, this is not an absolute. They also come the other way round. So let’s consider disc brakes in isolation (independent whether they are hydraulic or mechanical). What’s the issue with them? Well, as I was advised, the disc rotor tends to get bent at least once during the tour. While they can get bent back, this is rarely perfectly enough that they don’t rub. 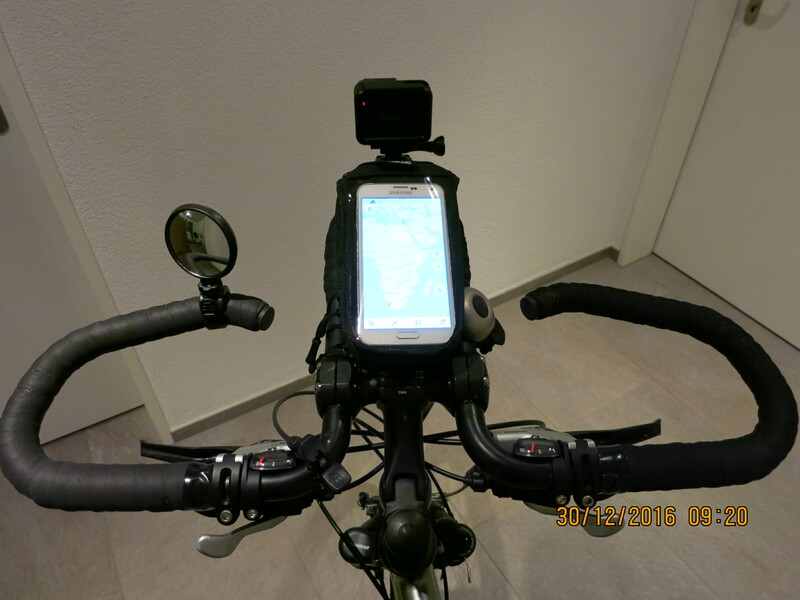 This wouldn’t stop me from cycling, but it would be annoying for sure. While having V-brakes is not an absolute must have, it anyway so happens that most disc brakes are hydraulic and thus didn’t pass my screen. 700 refers to the diameter of your tires. The bigger they are, the faster you will be with the same pedalling effort. So it had to be a 29er bike, which I understand to be more or less equal to 700 (though I also understand the pros amongst you will disagree as there are differences that—honestly speaking—are irrelevant to me). While most of our cycling will be on proper roads (with more or less ideal conditions), we’ll also have a fair bit of cycling on mud/gravel/corrugated/dirt roads. To make those manageable and have sufficient grip, being able to fit wider tires is a big plus. Finding a bike meeting any of the above requirements is easy. Finding a bike meeting all of those set me off onto a wild goose chase. Perhaps riders living in English-speaking countries (the vast majority of TDA participants) have somewhat more choice, or perhaps it’s just because I don’t have the skills to build my own bike, or perhaps I shouldn’t have insisted that all criteria be met . . . but I did. And so I checked every single bike of every single brand that I could reasonably obtain in Switzerland. After days of research and lots of questioning eyes and shaking heads in some of Zurich’s most reputable bike stores, I resigned to mission impossible—almost. Eventually, I had an epiphany moment: Why not check what bike Marc Beaumont used when he established the Africa cycling world record (C2C in 42 days)? And what an inside that was! KOGA was the magic word that Google had mysteriously hidden from all my searches. 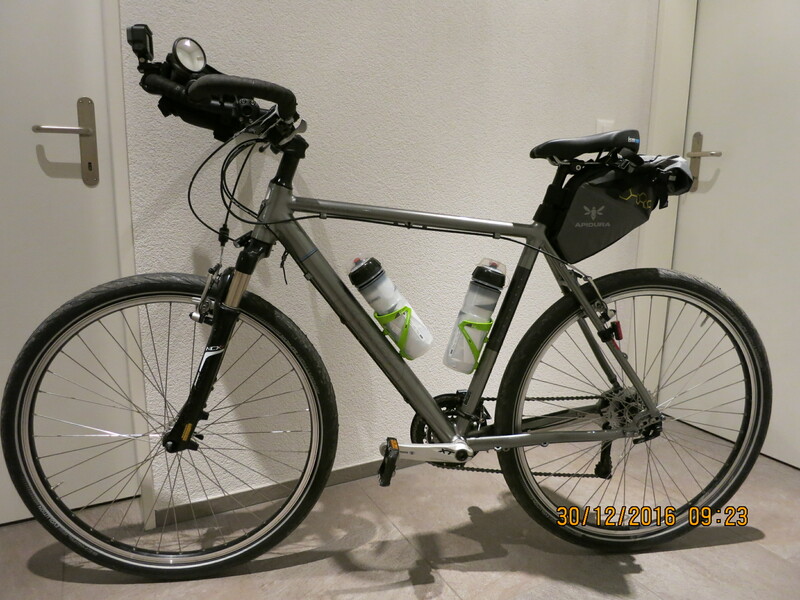 Turns out KOGA are specialized on trekking and touring bikes. Not only did their touring bikes meet all of the above requirements, I could even customize and configure my own bike online—and all of that at a fairly reasonable price. Wahoo! Check it out—here you can see my customized KOGA Signature Traveller specs. You will also see why it’s only “almost” perfect—it weighs 12.5kg, and that’s without handlebar, saddle, pedals, bags, water, gadgets and accessories. So don’t expect any record cycling performances from yours truly! Once I had figured out that KOGA Signature was the way to go (weight aside), of course I needed help to chose the right components, to speed up delivery, and to assemble and fit the final product into something I would be able to use and make sense of. 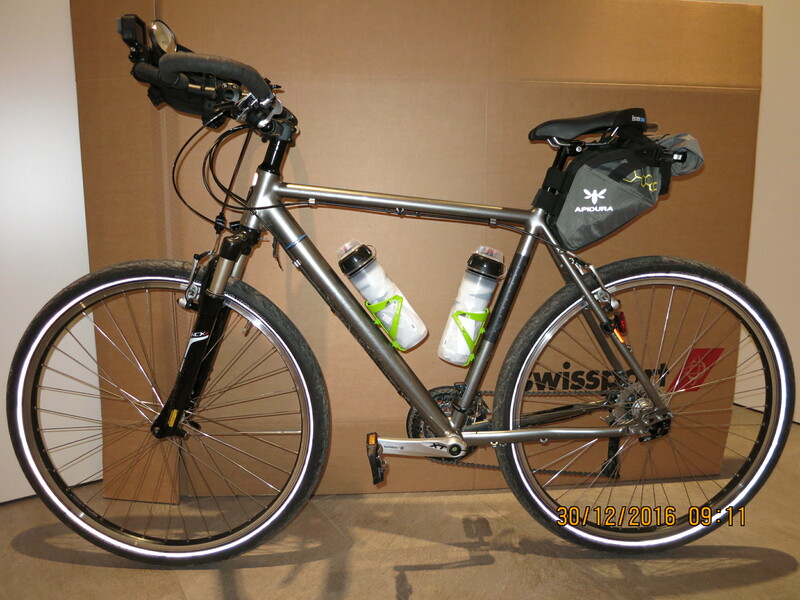 At this stage, a big thank you to Ralph Wehner from windRad, the local KOGA dealer in my area. Merci for all your invaluable help and support!!! The KOGA saddles didn’t seem very comfortable to me. I tried a few saddle options in Switzerland, but none seemed ideal. By coincidence, I recently went on vacation to Dubai, and so I made sure to check out the local cycling scene. Wolfi’s Dubai had a very promising website, and local expats confirmed this was the place to be. According to the experts at Wolfi’s, there was only one type of saddle to seriously consider for my trip: ISM PR. They come in different paddings, 60 being the thickest. 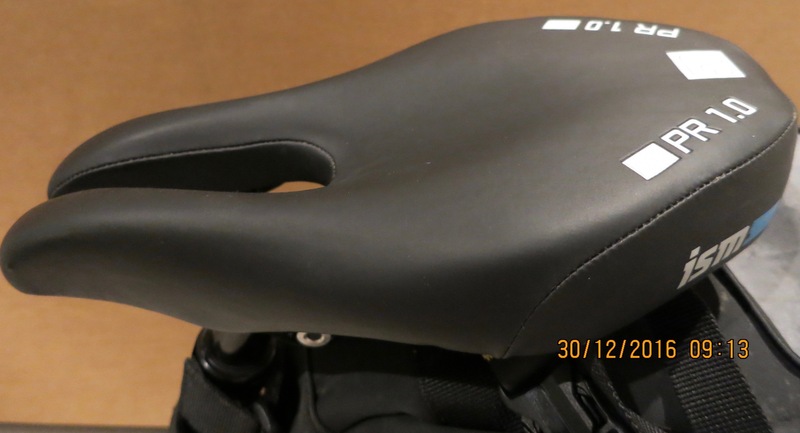 I went with the ISM PR 1.0 Saddle that has a padding level of 50. So far, on shorter rides, it’s proven to be a wise choice. I absolutely love its open shape, which means no pressure on soft tissue whatsoever. I also love that—in combination with my handlebar—I can change my seating position so that I can alternate my pressure points from in between my legs in a more horizontal racing-style position to the back of my seat bones in a more upright position, or something in between. However, only time will prove whether the ISM PR will spare me nasty saddle sores when tested to the extreme . . . Hands are the second main pressure points that tend to hurt—or simply go numb—after hours on the bike. Therefore, being able to change the hand position is critical. I was super lucky that Ralph (my local KOGA dealer) still had an older version of a KOGA touring handlebar—what a gem of the past! This beauty (see photo) allows me all kinds of hand and seating positions, and has plenty of space for all my gadgets. Unfortunately, this handlebar model was discontinued by KOGA, so I cannot advise you where to find something like it. Perhaps your local KOGA dealer also has some leftover stock. Otherwise, second-hand platforms might be the place to look. Following Ralph’s suggestion, I went with the Shimano Deore XT PD-T8000 SPD Pedals . They have SPD cleats on one side, and a flat platform with pins for extra grip on the other side. This means I can ride them both with cleats and normal shoes which should be an advantage when I use my bike to simply get around on rest days. The pins make them less slippery then the dual-sided pedal options currently available in the KOGA online configurator. 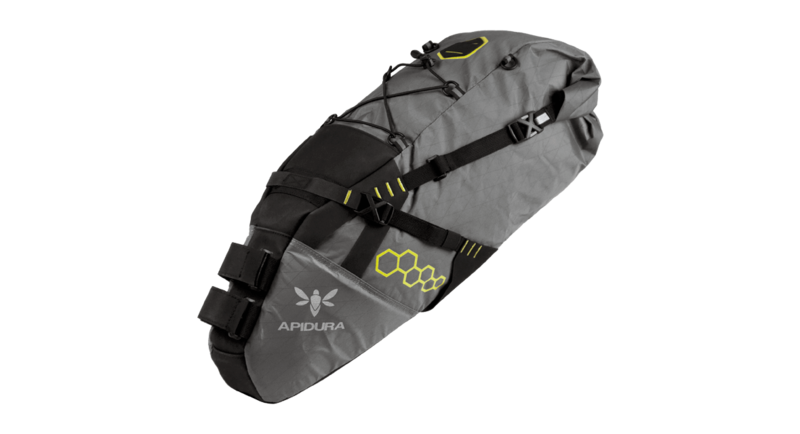 TDA don’t recommend rear wheel saddle bags for Africa, but I’d already bought my Apidura saddle bag previously, so I’m going to use it anyway. I love that it’s out of the way snug behind my saddle and that I can roll it quite small, or extend it much bigger to store things like rain protection, extra layers and the like. And I was pleased to see that Marc Beaumont used the same on his world record cycling trip through Africa. So if it worked for him, why wouldn’t it work for me? 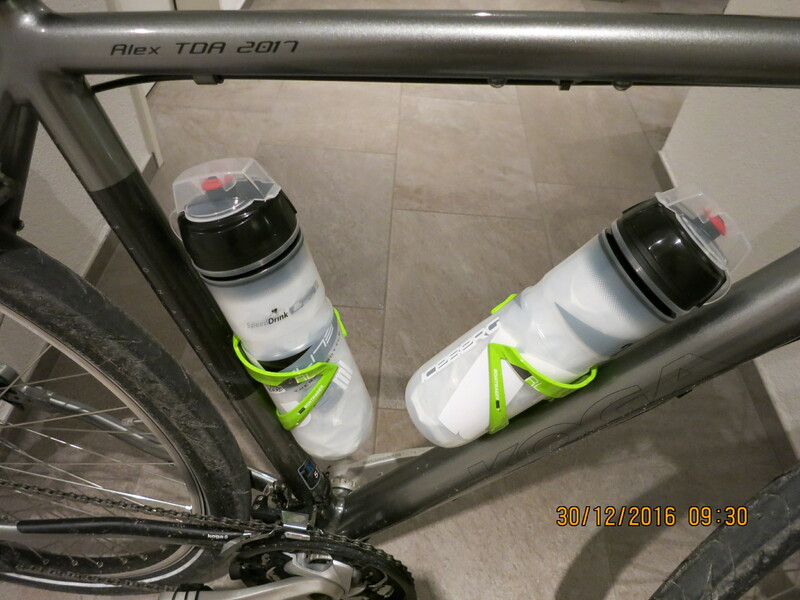 My KOGA frame allows me to fit two water bottles easily. I got two Elite Iceberg Thermal 650ml Bidons that claim to keep water cool for 2 hours, which would be nice if it really works when cycling through the Sudan. More importantly, the Elite bidons were the only ones I could find with a mouthpiece cover, so that I don’t end up eating all the dust and dirt that certainly would get stuck there otherwise. Little issues—big priorities! By the way, can you see on the photo above why KOGA Signature is called “Signature”? Now I only regret that I had it signed “Alex TDA 2017” rather than “Alex Cycles Africa”. Foresight doesn’t always come easy! We won’t be allowed to cycle when it’s dark, so perhaps bike lights are an overkill. However, I already had these D-lights that I can charge via USB, so I figured I might as well bring them along. Hopefully, they’ll make me more visible when it’s foggy, rainy or cloudy—though not sure drivers in Africa will care?! Top tube bag: As the name says, this bag was supposed to go onto my top tube. As luck would have it, the model I’m using (NC-17 Connect) fits perfectly inside my handlebar where I like it even more. It’s out of the way from my knees, and allows me to play on my phone (e.g. to check my location or to operate my GoPro) without looking down. That brings me to its key purpose: To hold my phone. The bag has a rain protection cover that still allows me to operate the touchscreen and see everything clearly. And it has a sizeable lower compartment where I can store an external battery (as well as other essentials). That way, I can charge my phone directly inside the bag. Wahoo—I’m loving it! GoPro handlebar mount: I’m not sure yet how often I’ll actually use this, but of course I had to get a handlebar mount with my brand new GoPro. It works well for photos, but has already proven too unstable for videos. Now I still need to figure out whether I prefer cycling with the GoPro mounted to my helmet, or sacrifice video quality in favor of attracting somewhat less attention—if that’s even possible. Rearview mirror: I was in two minds about using a mirror. On the one hand, it seems to be frowned upon amongst the pro-cycling community. On the other hand, some bike touring blogs highly recommend it. Having read about crazy accidents of experienced female cyclists during Tour d’Afrique caused by ignorant locals, I figured safety should warrant such a somewhat less professional look. Bell: I trust this last item needs no explanation. Now I just need to figure out how to properly disassemble and package my bike for the flight so that nothing breaks in transit! 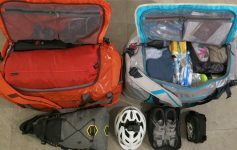 NB to Switzerland-based readers: SWISS airline provides bike boxes for free (162-92-28 cm) to everyone who registers a cycling sports baggage for their flight. You can pick it up at the check-in counter anytime ahead of your flight. Just note it won’t fit into a normal-sized car (I had to fold the cardboard to transport it back home). Like me, you might need to arrange a taxi van to transport your bike to the airport. 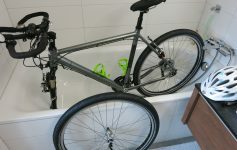 Next Article What to do when it’s too cold to clean my bike outside? What to do when it’s too cold to clean my bike outside?